DBS responds to basement flooding in Park Point homes. Park Point also called Minnesota Point, is a well known area for locals and tourists in the Duluth area. A small strip of land that is 500 feet wide and only seven miles long, has a smattering of new and old homes, parks and hiking trails. Countless tourists and local Duluthians enjoy Park Point Beach during the summer months. While many other people enjoy the trails where 200-year-old red and white pines tower over you and a plethora of birds can be seen flying over. This unique area was formed by sands carried from the South Shore and deposited by lake currents and by sediment deposited from the St. Louis and Nemadji rivers.1 This area is vulnerable to Lake Superior’s erosive waves. On the bay side, the land is low and is susceptible to flooding and wave-induced erosion.1 As most homes are only a few feet above the average water level, they often see these adverse effects. The University of Minnesota-Duluth, Lakehead University and the Minnesota Sea Grant Extension Program set out to survey homes in Park Point after the 1985-86 high water levels. The results of the survey can be found here. These survey results can be correlated to what homeowners are experiencing currently in the Park Point neighborhood. Homeowners in this area are having residual effects from the storms and high waters we had back in October of 2017. Many occurrences of basement flooding and massive shore erosion have been reported. Homeowners were left with wet, damp or even flooded basements. Fortunately, DBS has come up with a solution for their problems. The Owners and management teams of DBS, have been busy finding quality, lasting solutions to this age-old problem with homes on Park Point. The process we’ve come up with will take care of excessive amounts of water to make your basement dry again! 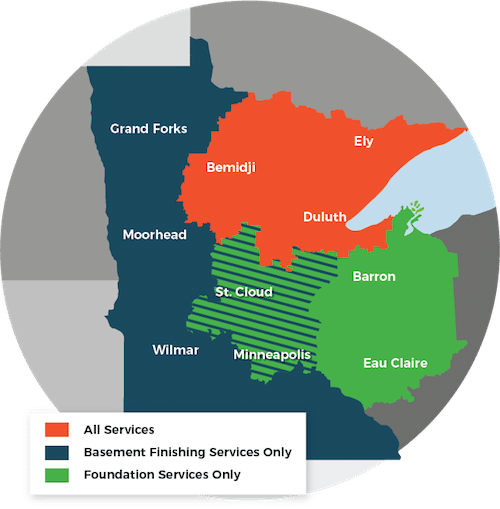 If you are a resident of Park Point, or even if you are not and have water problems in your basement, please reach out to DBS and schedule an appointment with one of our design specialists.